What a response I received from the last post on behavior clip charts - comments, e-mails, and pins, Oh My! So I decided to start a linky for teachers to share all those terrific ideas. Please link up and share your ideas for promoting positive behavior, developing classroom community, and helping students develop self regulation skills - all in a way that builds up a child. It could be a new post or one from the past. I am looking forward to hearing lots of great ideas! If you would like to add the linky to your post, here is the code. Make sure you paste it in "HTML" mode at the end of your post. Thanks so much! This is what blogging is all about- sharing our ideas. I was touched by your outlook and it made me change the way I do things. It doesn't stop there though. I shared the idea with my team and they themselves shared it with their teacher friends. It is spreading like wild fire. Best practices catching on quickly in the best interest of the students- wow. Amazing. Thanks for being the reason! I cannot tell how happy this makes me! Thanks for being open and willing to try something new! Nikki, thanks for inviting me to link up. I love that you're sharing alternatives. Great idea! I'll totally be linking up this week! I haven't been a fan of the clip chart since I was a student teacher when I saw my master teacher use it and it made my stomach turn! Luckily, I have found the school that completely agrees with my philosophies. Thank you for this and I have to say, you, too, are a brave woman! I'm so glad to hear you're linking up - looking forward to reading your post! I am number 125!!! Yay!!!! I would love to be here saying I no longer use a clip system - I was trained in RC years ago, and LOVE it - so much that I am the only 5th grade teacher in my building that uses morning meetings. However, I have succumbed to pressures and brought back the point/clip system. I look forward to reading what you are all doing to refresh me and bring me back to my core. Go RC! Our entire building does morning meeting. We use as much RC as possible considering most of us haven't been formally trained. I love it, too! Hear! Hear! Responding to positive behaviour and supporting children when they have inappropriate behaviour seems to me to make so much more sense than moving a clothespin to a new colour. Children are not cogs in a wheel and need to be cared for and treated as individuals. I am happy to be your newest follower. So true. It's certainly the way I want my own children to be treated. 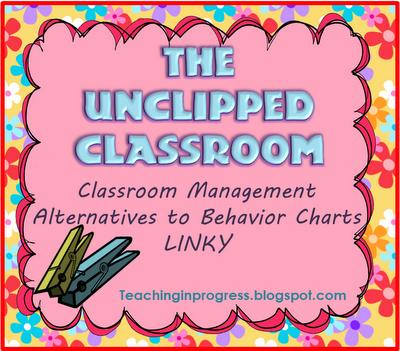 I just found your blog and was thrilled to link to The Unclipped Classroom Linky Party. You have provided us with a great forum to share alternative classroom management techniques. Thanks so much! This is definitely something I feel strongly about, both personally and professionally, and I am glad so many teachers have shared experiences and ideas. Thanks so much for sharing in the conversation! Hello Nikki and other teachers! I very much appreciate your blog post and those of the others who have joined the linky. This is my second year teaching kindergarten, and I too would love to find a way to implement classroom management without using a behavior clip chart. The reasons that you stated for ridding of this approach in your classroom really resonated with me, and the last thing that I want to do is make my students feel bad about themselves. The question that I have though is, how do you communicate with parents about their child's behavior? In my mind, stamping a color in there after having explained the meaning of each color to parents is an easy way to do so. This is the main reason why I am still using a clip chart even though I would rather try out other approaches. However, I would rather find another way to communicate about behavior because, first of all, stamping each agenda at the end of the day/during the day takes time that could be better spent. Second, I, as pointed out by at least one of the other bloggers, do not necessarily like recording the color the child is at at that time, because I would rather indicate how his/her day was overall. Any suggestions or advice would be greatly appreciated! I know this is a couple years later, but this is a great question- the parents always want to know "Did s/he behave today? ", so if you get rid of your behavior tracking system, how will they know if their child is behaving? The key is shifting your thinking from 'proper school behavior' as something the kids should already know, to something you are all learning and practicing. Just like ABC's and math facts, you want to create an environment where your little learners feel safe to make mistakes, and supported in trying to do better. You can send a letter to parents explaining that you will be teaching and practicing school behaviors and routines like lining up, taking turns, sharing, raising your hand; as well as learning to recognize and regulate emotions. And that young children need love, support, and patience as the develop their social and emotional skills. Explain that if their child is having difficulties, you will meet with them so you can work as a team to develop additional supports, targeted at helping their child build those key social and emotional skills. Then every now and then send home updates like- "We are learning how to Stop, Take Three Deep Breaths, and Think of a Solution when we get angry. Please ask your child to show you this technique!" The main idea is that children who 'break the rules' need support and practice, not punishment. And that the expectation is that we all lose out temper or make less-than-perfect choices from time to time- and it doesn't need to be a big deal. Nikki, I am trying to get to your linky page to see the different ideas for behavior management people shared, but I am not finding the link. Could you possibly send me in the right direction? She uses Conscious Discipline and writes so beautifully about it. So here is my question: what do you do if the behavior continues? What are the consequences? How many times can the child "take a break"? Sorry I am just trying to wrap my head around it. I am a first grade teacher and use the clip chart like so many others. I do like the idea. But I need to understand all the aspects before I go changing it all or I will lose my mind. (maybe it's already gone.... ;)- ) If the behavior is consistently not changing, they take breaks, and it's not necessary to go the office, let's say parents aren't helpful....what do you do? Help! Just trying to see all the sides of your system! Thank you! So, I'm late to this party, but I will be trying to do away with my clip chart after reading your post. Thank you for the great ideas and awesome reflection. Nikki-are you still blogging? What a wonderful post. I'm not a fan of these charts and they actually seem archaic to me-please everyone stop using them!!!! Have meaningful conversations and keep them private. Build real relationships and students will want to do their best. For the ones that struggle they need love and support. They may need an individualized plan but certainly not one for all to see. Embarrassing students by calling them out just makes it worse. Thanks again for posting!